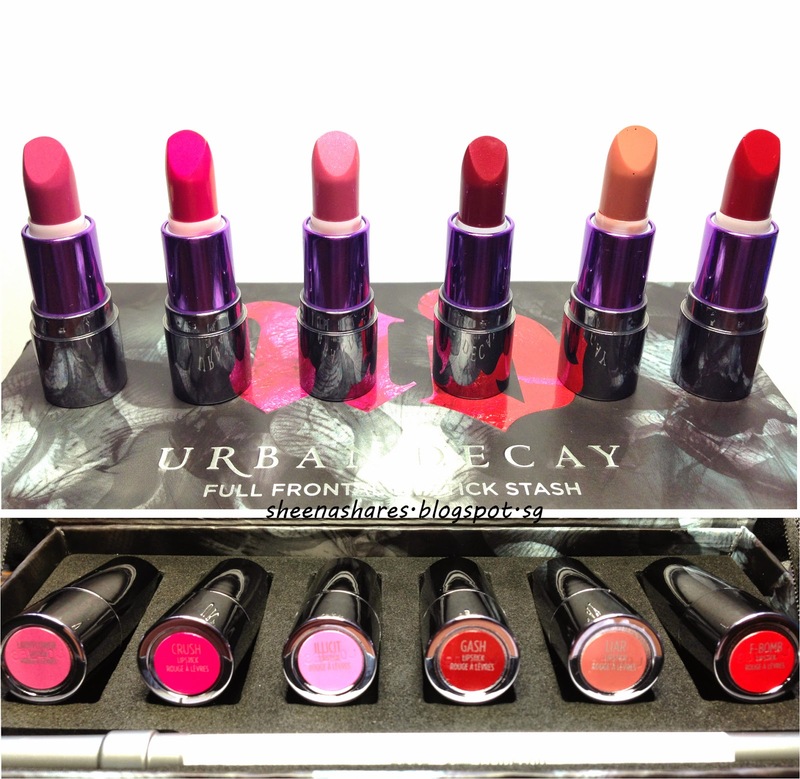 Review + Swatch | Urban Decay | Full Frontal Lipstick Stash | Sheena V.
If you're interested to see how each lipstick looks like in the tube up close, you can click here. I apologise in advance if any of the following pictures seem a bit yellow, I photograph under natural lighting and sometimes the Sun doesn't like to cooperate. Haha. I've tried my best to correct it! My opinions will be based mostly off their opacity and creaminess. Mainly because that's what I look out for when shopping for lipsticks. I won't be able to comment on the individual longevity as this is the first time I've worn any of these shades (with the exception of F-bomb, already own a full size prior to this purchase). Opinion | All but one lipstick were swiped once across my inner forearm. I had to layer Illicit twice to get that opacity. Even then I could still clearly see my skin underneath it. However, all of them glided on creamily on my skin. But we all know hand swatches and lip swatches doesn't always equate right? Hence I hope the following lip swatches gives you a rough idea on how the shades look like on a deeper skin tone. On me, this doesn't receive full marks as my pigmented lips still show through slightly (the outer edges of my lips are a muted brown). However, if you have paler coloured lips, this shade will give you maximum opacity. Lipstick didn't drag along lips. It feels exactly like how it's swatched on my hand. Colour is pigmented enough to disguise my natural lip colour. Colour was distributed evenly. Able to build up to make it bolder. Colour did not hide my natural lip colour at all. Colour was not distributed evenly. Unable to build up. Doing so resulted it in being gloppy. Unable to build up, bold colour pay off on first application. This shade has blue undertones, hence will not emphasize yellow teeth. Colour is pigmented enough to disguise most of my natural lip colour. Outer edges of lips could still be seen. Opacity: 5/5 Colour is pigmented enough to disguise my natural lip colour. Colour was distributed evenly. Due to yellow undertones, teeth will seem more yellow. This is a fussy red shade because some transferred to my teeth just by smiling to the camera. Longevity: This particular shade is very high maintenance. Not recommended for a night out eating. Transfers very easily, mostly gone after a meal. IS THIS KIT WORTH IT? Well, this kit retails for 39USD. Each lipstick is only 0.04oz, slightly less than half of a full size (0.09oz). In addition, a full size clear lip pencil (20USD) is included. Therefore, one lipstick is essentially 3.2USD. It boils down to preference really. Huge fans of Revolution Lipstick (me) would definitely buy it because it allows them to own more shades without spending an exorbitant sum. For those who like, but not love it, I would say: skip it. The lip pencil ain't that great anyway. I'm sure you can get dupes for cheaper elsewhere. If you couldn't care for the lip pencil, one teeny tiny lipstick would be 6.50USD to you. That's enough to get you a good drug store lipstick. These shades included aren't exactly unique. You're paying mostly for the novelty of the item. Don't get me wrong, I love this set. Just that I personally don't think the price is right. Factoring exchange rate, I got mine at approximately 50SGD. Dividing shipping amongst my purchases, I probably only paid an extra 2SGD for this set. Sephora Singapore will probably release this in late November (don't quote me on that). Seeing how they priced the other UD products, my guess is that it would retail at about 59SGD or more. I personally wouldn't pay that price, especially since it's released so late. Meh. I hope you enjoyed this post. 'Till the next one! In case my fellow Singaporean beauty addicts are wondering how I got my hands on this, I had this shipped via Vpost. It took only 7 working days in total i.e. from the day I ordered it to the day I received it. I don't now about you but that's amazing to me.